Anaheim based company, Intense Lighting, manufacturer of award-winning, sustainable lighting products reached out to us with the need for a branded “About Us” video that highlighted their culture, facility and products. Together, we collaborated on the storyboard and script. We shot the video in 1.5 days. 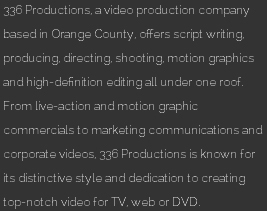 In post-production, we provided the services of editing, color correction, music editing, sound editing and mixing, compression, and delivery. We also created an animated logo bumper.